Thought I’d get in a new post before I start school tomorrow. I spent New Year’s Eve in Hancock Park down in Los Angeles. Anyone with an interest in paleontology should know this name. If not then they must live under a rock! 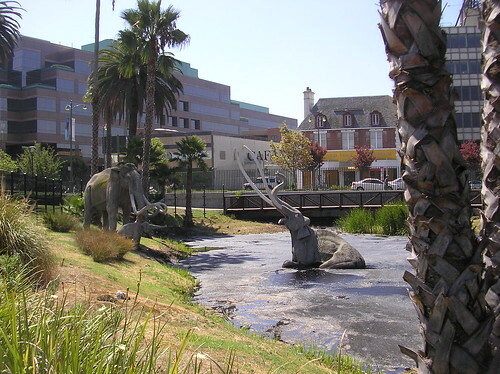 Hancock Park is home to the La Brea Tar Pits, one of the most famous fossil sites in the world. Tens of thousands of people flock to the site each year to marvel at the wonderfully preserved bones of giant ice age beasts. The collections of fossils are a hotbed of research, for they give us one of the most complete pictures of an ancient ecosystem paleontologists could ever ask for. 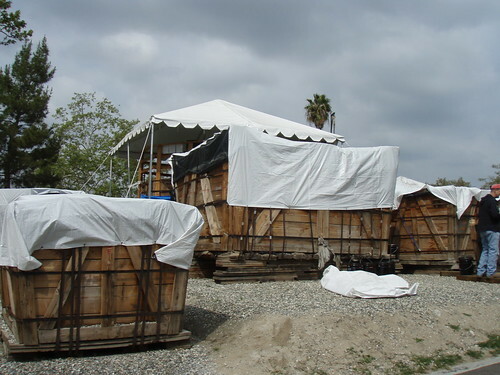 The site, also known as Rancho La Brea (Spanish for “ranch of tar”) was first explored by geologists in 1901. The asphalt pools were being harvested to help pave the streets of Los Angeles. As the pools were being drained workers began finding the bones of animals. At first they thought they were the remains of cattle that had become mired in the tar. One discovery changed all of that: the skull of a saber-toothed cat. Suddenly it was obvious that these weren’t livestock remains. Continued excavation revealed the bones of extinct beasts such as mammoths, horses, ground sloths, lions, and other such creatures. UC Berkeley carried out initial excavations but soon the newly founded Los Angeles Natural History Museum took over operations. As they excavated the pits, more and more fossils were uncovered. After decades of excavating the museum’s basement was overflowing with ice age fossils. So in 1975 construction began on an on site museum to house the still growing collections of fossils. The George C. Page Museum opened in 1977 and has changed little ever since. While most tar pits ran dry of both asphault and fossils, a few active pits remain in the park today. One of these, Pit 91, is still yielding fossils, even after 60 years of work. And while Rancho La Brea had yielded so much, there was still a lot we had to learn. Most early collections focused on the large mammal bones. It was only recently, about 30 years ago, that scientists realized that microfossils such as reptiles, insects, small mammals, and plant seeds and pollen can yield valuable information on the ancient land’s climate and environment. For most of that time Pit 91 was the only active source of microfossils. But in 2006 researchers at Rancho La Brea caught the break of a lifetime. While construction workers were excavating a pit for the Museum of Art’s new underground parking structure, they uncovered the remains of buried tar pits full of fossils. Paleontologists scrambled to excavate the fossils so as to not interfere with construction schedules. But given the painstaking work of uncovering a paleontological site, this was going to be near impossible. But then someone came up with the bright idea of digging around the deposits and encasing them in tree boxes. That way the fossil deposits could be extracted intact and then moved to another part of the park where they could be excavated at leisure. The project yielded 23 boxes of fossil deposits (including a nearly complete mammoth), thus earning the name “Project 23”. After a couple of years of work the project has yielded valuable new fossils, both big and small. Researchers think the project has the potential to double the Page Museum’s collections and offer exciting new data on ancient Los Angeles. Despite this bountiful new find, the museum itself has changed little in the 30 years since it opened. They have put up a few cases of material from Project 23, including a display about a partial “lion” skeleton known as “Fluffy”. While the Page is one of my favorite museums, there is a lot of room for improvement. The skeletons, while numerous, are in simple static displays high up on elevated platforms. Platforms annoy me because they exaggerate the size of the animals and don’t allow you to fully get a feel for it. And each skeleton has a short description plaque that doesn’t tell you much. There are other displays that discuss the science behind Rancho La Brea but they aren’t terribly informative. The museum also features a large preparation lab, which is expansive and often busy. The last couple times I have been visited nearly half the lab was taken up by their new mammoth. Whether or not the museum will get the overhaul it needs is uncertain. Its parent institute, the LA Natural History Museum, is currently spending $135 million on renovations in anticipation of their centennial. So it may be a while before the Page Museum gets the tender loving care it so desperately needs. Despite its shortcomings, I would recommend dropping by if you’re ever in LA. The displays, while not too sophisticated, are nonetheless of a quality you can expect from higher up institutions. Their fossil lab is reason enough to visit. And the park, complete with a few remaining tar pits, provides a nice little splash of nature in a sea of urban development. Let’s hope this world renowned site and museum gets it’s much deserved update in the future. As you may have noticed, I was on quite a hiatus during this holiday season. Way too much going on. Hopefully when I start school next week I’ll settle back into my old routine. But now that I am back to writing blog posts, what shall I write about to not only break the silence but to also kick off the new year? The answer came to me while I was at Carrizo Plain National Monument this weekend: Wallace Creek. What is so odd about Wallace Creek? There you can not only see the funky bend but also another bend to the left. That is an ancient bend that the creek once flowed through but has since run dry because it was cut off from the main channel. This is all because Wallace Creek runs across the San Andreas Fault. For those of you who don’t know, the San Andreas Fault is an 800 mile fault line that runs north to south in California and is one of the longest faults in North America. San Andreas is what is known as a right lateral fault. Lateral movement occurs when rocks on one side of the fault slide past rocks on the other side in a horizontal fashion with little (if any) vertical movement. Right lateral means the direction its going: if you and a buddy stood on opposite sides of the fault and faced each other, you would be moving to your buddy’s right and vice versa. But how did the creek get its shape? While the fault moves at about 1.2 inches a year Wallace Creek did not take its odd shape (called an offset channel) gradually over time as might be suggested by this fact. Rather, its shape came about very suddenly. Instead of moving gradually over hundreds or even thousands of years, Wallace Creek has been twisted by jumps made during earthquakes. Look back at the aerial photograph. See the channel on the left? It’s what’s called a beheaded channel. It was once the main creek bed. It flowed straight across the fault around 10,000 years ago but a series of earthquakes every few hundred years offset the channel. Eventually the creek cut through the first bend and separated the offshoot and began carving the modern channel about 3800 years ago. More earthquakes offset the new creek creating the offset channel we see today. The ancestral channel is but a ghost; a stream without a source. 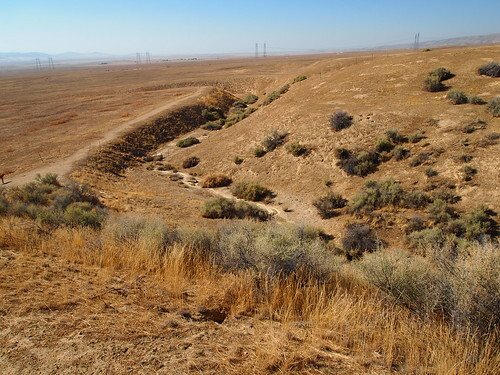 Wallace Creek may be the largest and most dramatic example, but right next to it are several smaller streams that have also become offshoot and beheaded channels. So if Wallace Creek moves in leaps and bounds during earthquakes, when was the last time it moved? History can help us with this one. 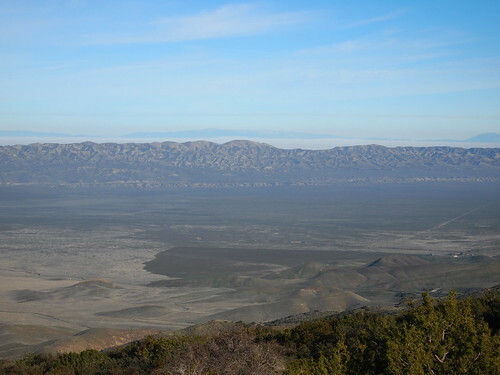 Farmers and ranchers have been working on Carrizo Plain since the time of the Spanish. But they had no idea that they were sitting on a time bomb. On January 9, 1857, the land seemed to come alive as it shook violently. San Andreas had unleashed an earthquake just north of Carrizo Plain that caused Wallace Creek as well as the rest of the valley to offset by 30 feet. The earthquake was one of the most powerful in American history: an estimated 8.0. The quake was felt from Marysville south to San Diego and east to Las Vegas, Nevada. The nearby Kern River had its current turned upstream and its waters ran four feet deep over its banks. A cattleman on the Plain reported that his circular sheep pen was converted into a crude s-shape. The surface of the earth along the fault was ruptured for almost 220 miles. Wallace Creek is a fascinating look into the workings of the earth. Had it not been for the San Andreas Fault, it would be nothing but a barren, unexciting gash in the land. But Wallace Creek is just one of the reasons I have become so fond of Carrizo Plain. I hope to one day show you what an incredible place it is. But for now, I’d like you to take a moment to ponder on the marvels of the Sand Andreas Fault at a little place called Wallace Creek.